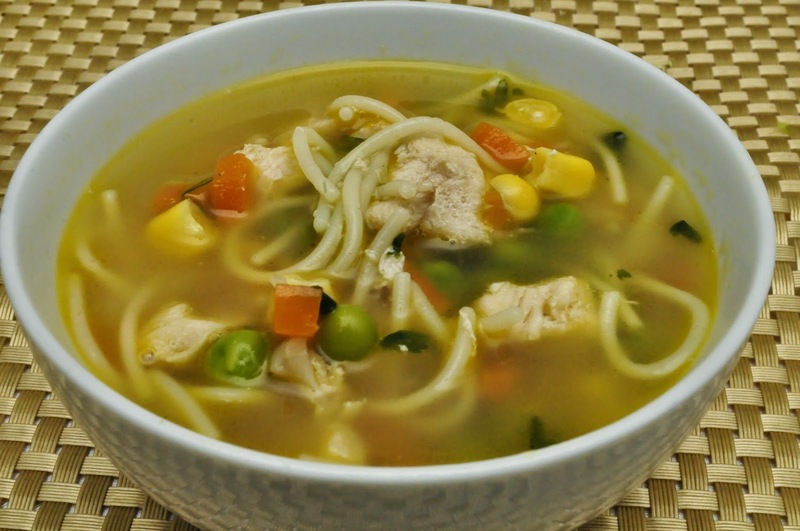 This chicken noodle soup is perfect when you are down with cold or on any regular day. It is great for fast breaking. Make it as a clear soup or as a creamy soup. Use any noodle of choice. 1. Wash and clean the chicken. cut into bite sized chunks. 2. If using frozen sweet corn and green peas, thaw them in water. 3. Prepare the noodles to desired doneness like you usually prepare them, rinse them under cold running water and keep them aside. I used Fidelini pasta. 4. 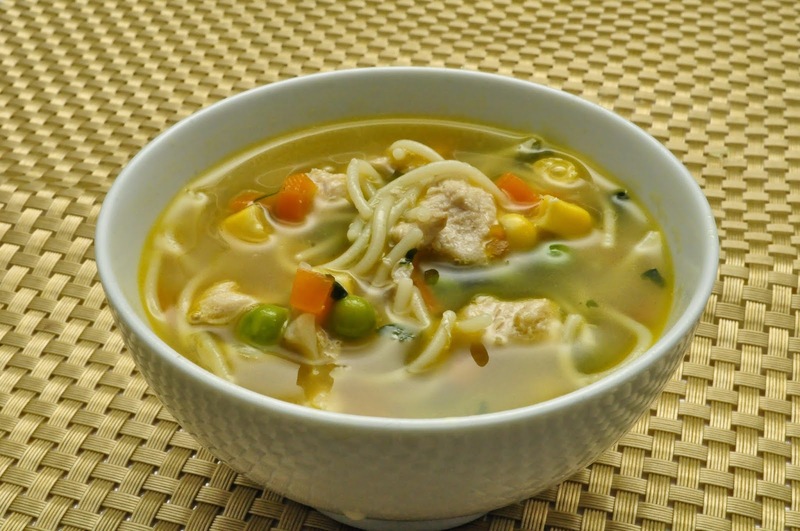 If you want to make a creamy chicken noodle soup, then boil the potato till very soft. Mash it and keep it aside. I made a clear soup so skipped this step. 5. In a saucepan or cooking vessel, add the chicken chunks, half of the chopped onion, half of the cubes carrots, peppercorns, garlic clove, salt to taste, half of the coriander leaves, 2 cups of water. Bring to a boil and continue to cook till chicken is cooked. 6. If fat accumulates on top while the chicken is cooking, skim it out with a spoon and discard. 7. Remove the chicken pieces and keep them aside. 8. Strain the chicken broth into a cup or bowl. Discard the other cooked ingredients. 9. In a saucepan or cooking vessel, melt butter. 10. Add the remaining chopped onions and fry till they turn translucent. 11. Add the remaining cubed carrot and some pepper powder. Mix well. 12. Add sweet corn and green peas and mix well. 13. Add the chicken pieces and mix well. cook for 5 minutes. 14. Add the chicken broth and cook on medium heat till the carrot cubes are cooked and turn soft. 15. If preparing a creamy soup, add the mashed potatoes and mix well. 16. Add the cooked noodles and mix well. 17. Add the remaining coriander leaves. 18. Adjust the consistency by adding water if needed. 19. Adjust the salt and pepper and continue to cook for 5 more minutes. 21. Squeeze some lemon juice if want to add a tangy taste to the soup. My kind of soup,filling and comforting..